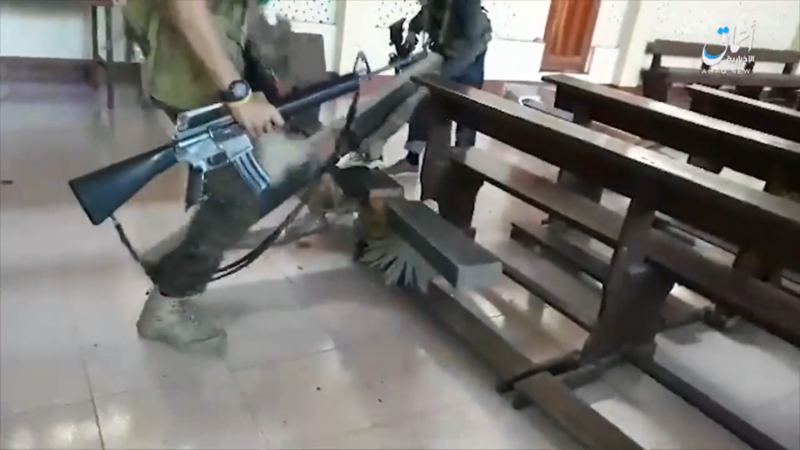 The Islamic State’s Amaq News Agency released a short video showing the destruction of a church inside Marawi city. This is the second video released by Amaq from the southern Philippines city. The video comes as the crisis in Marawi enters its second week. 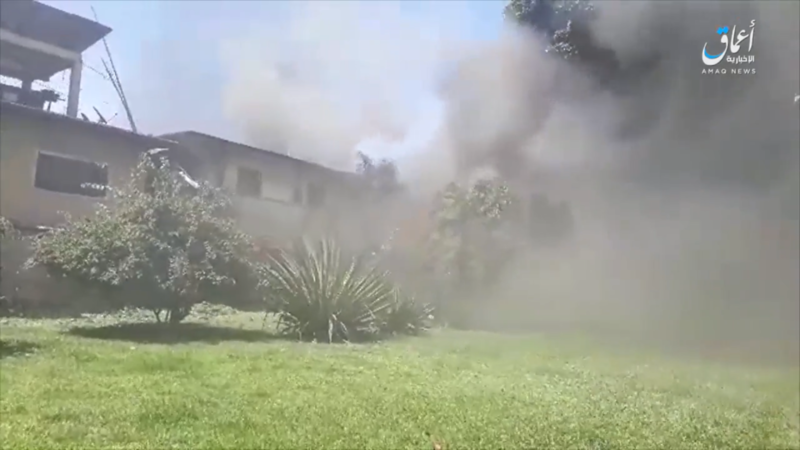 At least 175 people have been killed in the siege so far, while thousands of civilians have been forced to flee the city. 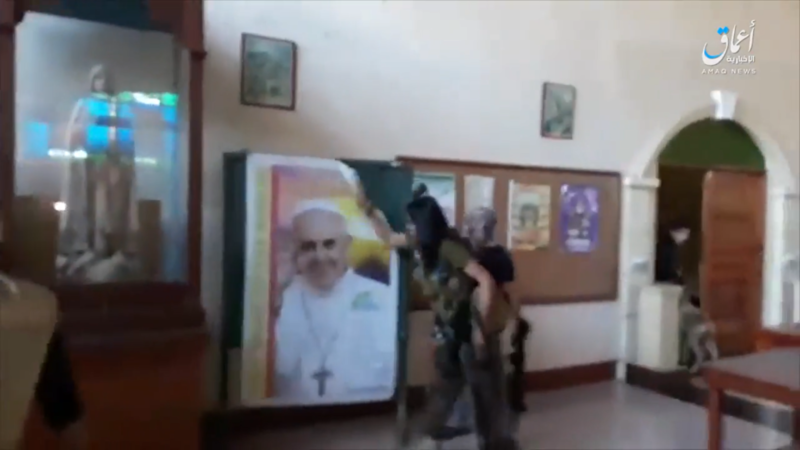 The video details Islamic State-loyal fighters destroying religious symbols and vandalizing the inside of the church. 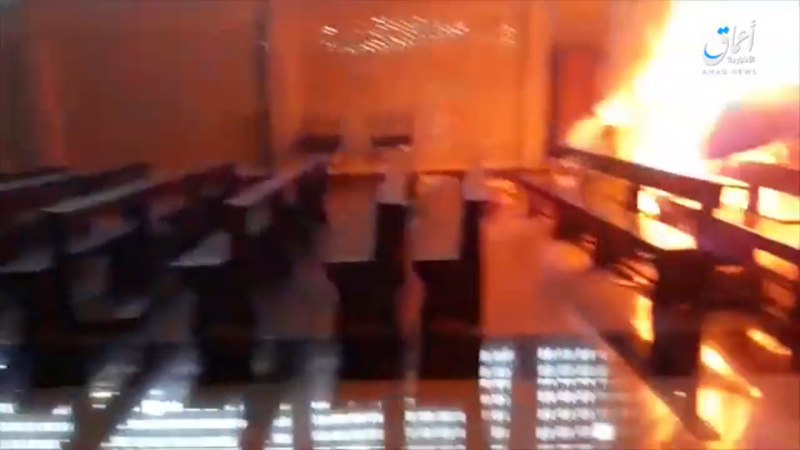 Afterwards, the jihadists set the structure on fire before the video ends. 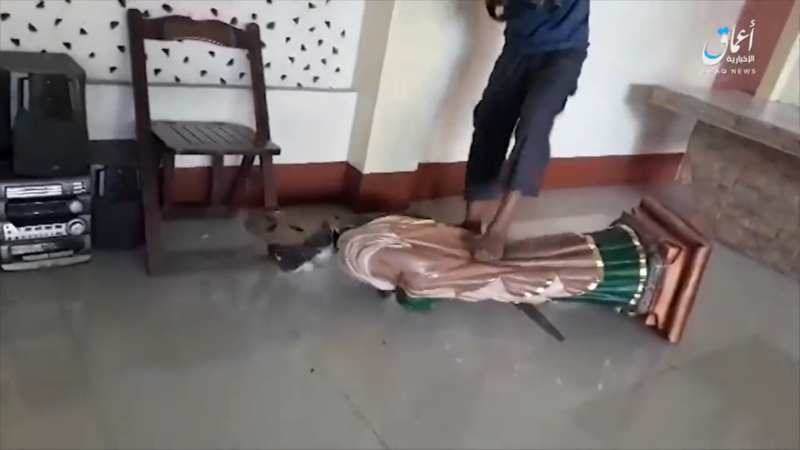 It is unclear when the footage was filmed, however, destruction of churches inside Marawi have been reported since the attack started late last month. Last week, Gen. Eduardo Ano, the Chief of Staff of the Armed Forces of the Philippines, told the Associated Press that foreign fighters are buttressing the local jihadists’ ranks. According to the AP, “three Malaysians, an Indonesian and possibly Arab extremists have been killed” in the fighting. At least one Chechen fighter has also been reported killed. Philippines Defense Secretary Delfin Lorenzana has also said that the jihadists inside Marawi numbered around 400 and that four Islamic State-loyal groups are present inside the city. Lorenzana told news outlets that Isnilon Hapilon, a US-designated global terrorist and former head of the al Qaeda-affiliated Abu Sayyaf Group, brought along 50-100 fighters with him to join 250-300 militants of the Maute Group, which is also called the Islamic State in Lanao. The Bangsamoro Islamic Freedom Fighters and Ansar al Khilafa Philippines have each contributed 40 fighters, as well. The siege began on May 23 when the extremists, who have sworn allegiance to the Islamic State, infiltrated Marawi. The jihadists quickly began fighting local security forces, capturing buildings, and setting up checkpoints. 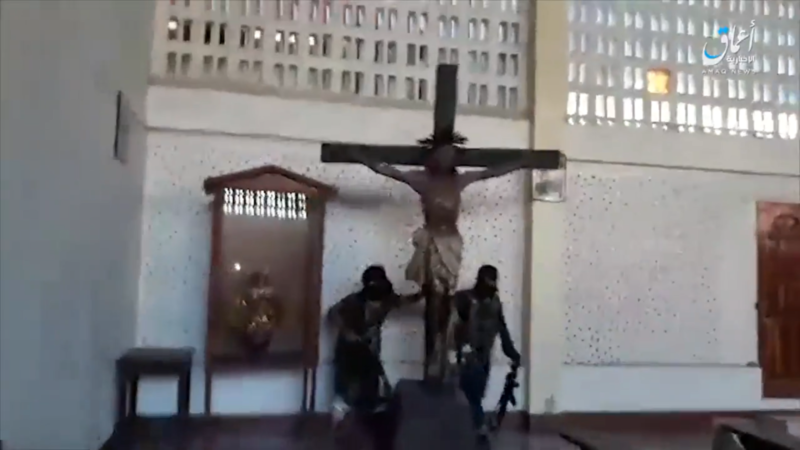 How is it they can reconcile doing this to Christian churches and no one speaks out about it? Where is the condemnation? 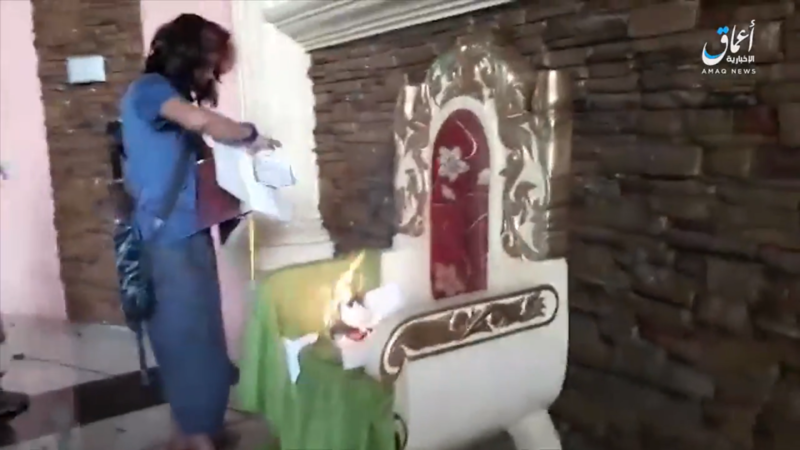 If western forces filmed themselves desecrating mosques like that, Muslims worldwide would be on a rampage unseen since the siege of Jerusalem in the middle ages! Why does it seem to be their right to do this? Why hasn’t the Philippine military gone in there” whole hog” and crushed these murderers and thugs? Seems they have no problem killing drug dealers out-right on the streets, why not these, ..terrorists? Boggles the mind. Chechens? 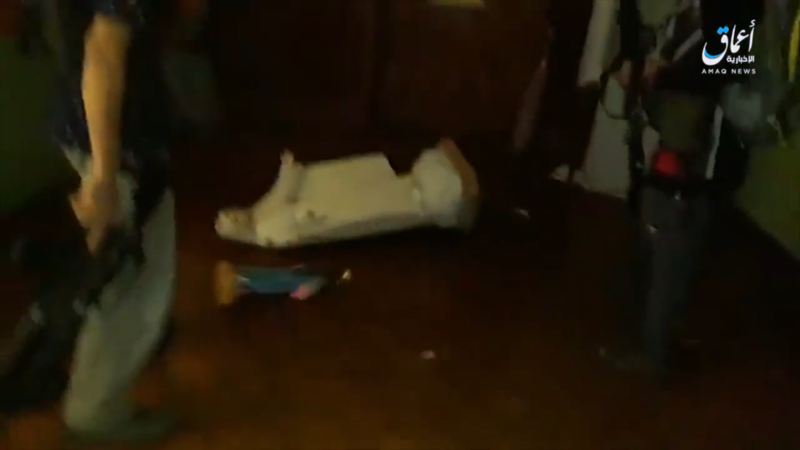 How did they allow them in? There definitely seems to be a lack of common sense there. I agree with Den entirely, where is our backlash. This is more than unfair. My question now is what is America’s strategic plan of action… Any thoughts on how this is going to end? And to think the liberal media blames religious intolerance on the keepers of freedom, constitutional values, and conservative and moral thought. The major three blind mice of liberalism will, if not disavowed, defeat Western civilization. They are: blindness to the group think of political correctness; globalization at the expense of sovereignty and freedom; and blind openness to all forms of secular thought. Wake up America! This is coming to your churches!